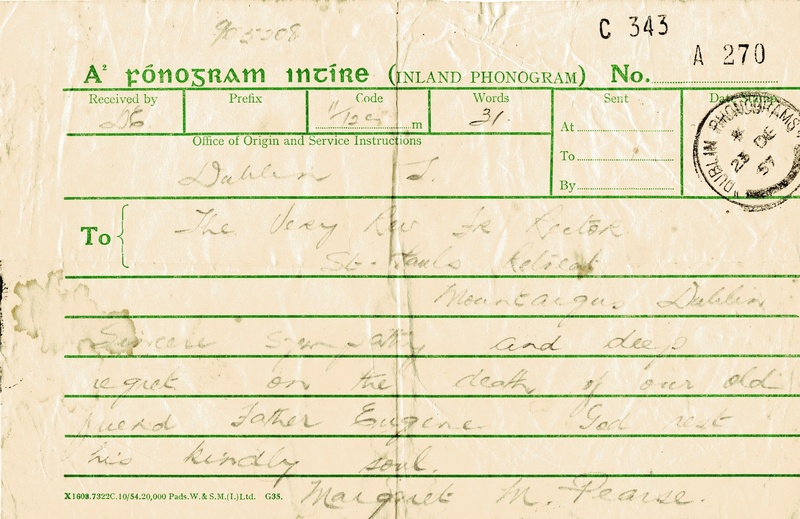 Telegram sent to Mount Argus by Margaret Pearse, mother of the Pearse Brothers on the occasion of the death of Fr Eugene, CP. Fr Eugene Nevin CP (he was known as Thomas Nevin before he became a Passionist Priest) was born and raised in Carrowcrin, a small village in the parish of Ballinakill, Co Galway only a short distance from the villages of Tomany where my parents lived and Abbey where his cousins the Holohans lived. My interest in Fr Eugene began after reading a memoir which his grandnephew John Holohan had kindly given to my brother Vincy. Though the memoir had been written by Fr Eugene shortly before he died in 1957, it dealt only with his early life growing up in Carrowcrin. This may have been deliberate because there was still much he had to say about his later life especially his close association with the leaders of the 1916 rising. It would seem that around the same time in the 1950s when he was writing about his early life he was also busy putting on record his role in the Easter Rising. This was done in the form of a lengthy witness statement for the Bureau of Military history and would remain locked away in great big steel boxes unavailable for public scrutiny for more than 50 years. Eugene was also known and remembered by his order for another but very different witness role he was asked to play, this one to do with the canonisation of fellow Passionist priest, Fr Charles – a man with whom he had worked and knew very well and whose saintliness he had observed at close quarters. The Bureau of Military History was established in 1947 by the Irish Government in collaboration with a committee of professional historians and former Irish Volunteers. The Bureau’s investigators consisted mostly of senior army officers who were given the job of compiling detailed statements from participants in the Irish rebellion. In some situations, as in the Nevin case, the statements were written by the witnesses themselves. By the time the Bureau was wound down a decade later it had collected 3,600 pages of evidence, 56 of which were contributed by Fr Eugene. It would appear that he had a great deal more to say than most, however that might be interpreted. Some of the core veterans like De Velara whose Government had set up the Bureau refused to give evidence. 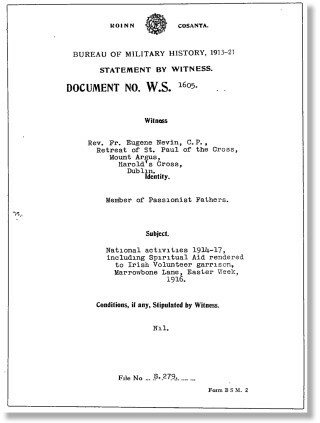 In 1949 all of the statements collected were put into 83 steel boxes and kept in a strong room in Government buildings for over 50 years, much to the dismay of historians who had cooperated with the project only to find that the information would not be available for public or scholarly scrutiny for a long time. It was not until 2003 following the death of the last remaining recipient of a military service pension that the documents, began to be available for release. Better then than never because it is generally agreed that the release of this vast collection of documents has made it possible to get a real feeling for what went on and who was involved in the activities of Easter Week 1916. According to one historian “the witness accounts bring events alive with an immediacy and sense of location that a more formal history cannot provide”. Another historian had this to say: “While the witness statements do not fundamentally alter our knowledge of what occurred they enhance our understanding of the motivations, mentality and experiences of the revolutionary generation, preserving something of the texture and complexity of the past rarely recorded by conventional sources”. If Fr Eugene had a weakness it was a tendency to over egg his memoirs with flowery language and literary allusions that sometimes impact on readability. This however should not affect or compromise in any way the substantive content of the story he has to tell. He was probably in his 80s when he wrote his statement and when he died in December 1957 he was approaching his 90th year. One of the obituaries at that time described him as a man who had time for everybody, “who formed lasting friendships”, was “beloved as a confessor” and someone who enjoyed “the respect and confidence of the men who moulded the destinies of modern Ireland”. The complete Witness Statement is included here without modification and I have also attempted to summarise some of the events and experiences he describes, putting them in context with short profiles of the leaders with whom he was involved. Back in 1955, two years before he died, Fr Eugene celebrated the Diamond Jubilee of his ordination at St Paul’s Retreat, Mount Argus. The event was later recalled by a fellow Passionist in the following way: “We realised on that occasion that his long and accurate memory was a treasure-house of good things old and new. He recalled the events and friendships of his early life and spoke to us of the turbulent years of conflict in Ireland and of his close association with the national leaders of those days. His friends included the bothers Pearse and many of the noted personalities of the Easter Week Rising, to which he gave his strong moral support”. 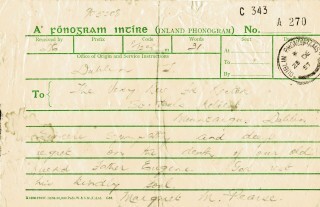 Since the Pearse brothers were singled out for mention, it may be appropriate that we start with the Pearse Family though in his Witness Statement Fr Eugene records a longer more frequent and detailed relationship with Eoin MacNeill who disagreed with Padraic Pearse and was strongly opposed to the Rising taking place when it did. It is, I suppose, a measure of the man that he could remain a close friend and confidant of both parties during a period of such great stress and uncertainty. Patrick Henry Pearse (also known as Padraic Pearse) was born 10th November 1879. He was an innovative educationist, barrister, poet, writer, nationalist and political activist. His younger brother Willie was born in 1881 and an artist by profession. Both lived at 27 Great Bruswick Street, now known as Pearse Street. Their father, James Pearse, originally a Unitarian from Birmingham, England had a flourishing stonemason business enabling his family to have a comfortable middle-class upbringing. It was this stonemasonry business that brought the Pearse family initially into contact with the Passionists and Mount Argus. The records show that back in 1877, James Pearse wrote a letter to Fr Pius Devine CP, then Rector of Holy Cross Belfast requesting a reference as he started a new business in the artisan/stonemason area. 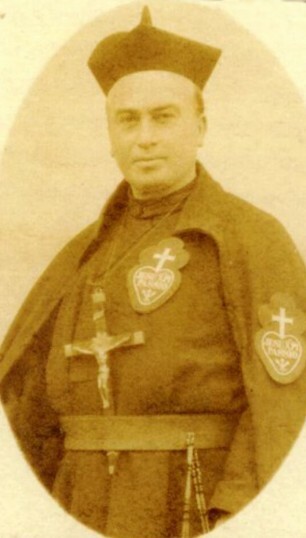 In a subsequent letter, Fr Pius, then in Mount Argus, recalls instructing James in the Catholic faith and receiving not only him but also his former wife and children into the Church. In that letter he wishes James Pearse well in his new venture and says he will give him preference if it is in his power. It could be argued that this new relationship benefited both parties in different ways. Among the many works carried out by the father and son Pearse team, still there to be seen in Mount Argus, are the Pulpit, the statue of the Pieta by James Pearse and a statue of Our Lady by Willie Pearse. Leading up to 1916 it would appear that many of the insurrection leaders including the Pearse Brothers sought Fr Eugene as their regular confessor. Eugene rarely refers to this in his memoirs but that is not surprising given the nature of the subject. To quote from the Order’s own files “it was well known among the Community in Mount Argus in 1916 that the two priests most sympathetic to the Irish Volunteers were Fr Eugene Nevin and Fr Kieran Farrelly. Fr Eugene was from Ballinakill in Co Galway and Fr Kieran was from Kells in Co Meath. Fr Eugene recalls in his witness statement how on Good Friday 1916 he was absent from Mount Argus preaching in a city church. “During my absence, Pat and Willie Pearse called to see me. I was and am so sorry that they couldn’t wait as I never saw them after that”. Elsewhere in the archives another Passionist priest, Fr Leo Cribben recalls more fulsomely what happened that Good Friday evening in Mount Argus. “On Good Friday night 1916 the preaching of the seven last words of Christ was in full swing in Mount Argus to a packed house. During the course of the sermons a number of men approached me at the back of the Church and asked me if it were possible to get a priest to hear their confessions. They had not long to stay. I accepted their request and found the priest named Fr Kieran to hear their confessions in a room nearby. It was only afterwards that I discovered the names of some of these men. There was Padraig Pearse, one of the Plunket boys (it later transpired that it was Joseph) and Eamonn Ceannt. The other names I don’t recall but certainly these three were among their number. I saw their confessions were heard by the priest and afterwards they asked if they could listen to the sermons but there was no room in the Church”. Fr Cribben recalls how he brought them on to the sanctuary were the students were seated. 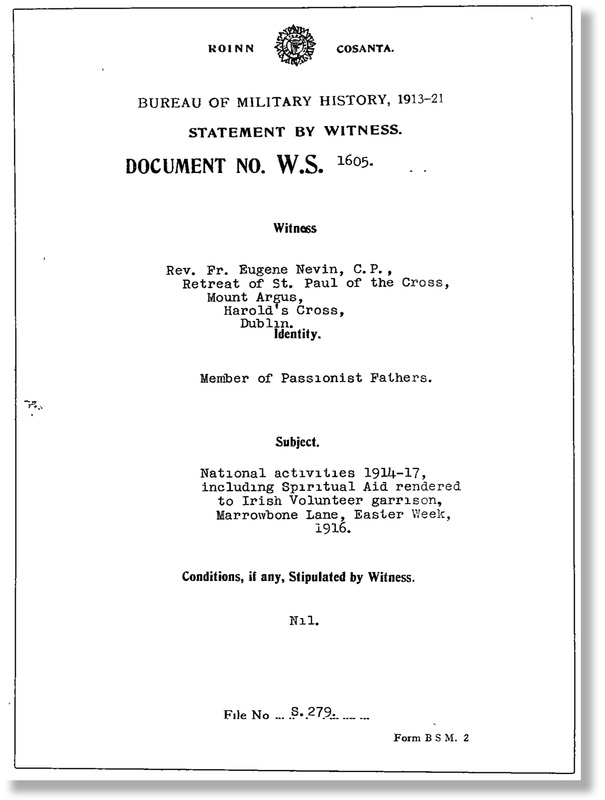 (The Easter Rising 1916 – the Passionists Info PDF Files 150). “This is to authenticate my order in today’s Sunday Independent. Great influence will be needed at the first possible moment, and in every direction to secure faithful obedience to that order throughout the country and avert a very great catastrophe” – signed Eoin MacNeill. The contents of the letter were a surprise to Eugene because he had been far too busy to have read the newspapers and as he says: “A verbal message asked me to go round to the different centresat once and impress upon the leaders and the boys the importance of obeying the order not to parade next day”. Eugene did his best to follow MacNeill’s instructions but it soon became obvious there was going to be no turning back. “Next forenoon, Easter Monday Bank holiday, I was surprised and not a little shocked to see the Volunteers marching down Kimmage and Harold’s Cross roads, on towards the city. I didn’t know what to think, what to surmise, but all doubt was soon dispelled as news of the first clash of arms and sound of rifle fire reached us. The battle of Dublin Easter week had begun, though ending in apparent defeat and disaster”. The Rising had begun on Easter Monday, 24th April 1916. It was Pearse who read the Proclamation of the Irish Republic from the steps of the GPO but after six days of fighting with heavy casualties and much destruction of property he was forced to issue an order to surrender. The leaders including the Pearse brothers were quickly court martialled and sentenced to death by firing squad. Pearse himself together with Thomas MacDonagh and Thomas Clarke were the first of the rebels to be executed on 3rd May 1916. Mercy College, Woodford’s Transition Year class of 2014.